The incline dumbbell bench press targets your upper chest -- the clavicular head of the pectoralis muscle -- more than a flat bench press does. To do the incline press, you need a piece of equipment that allows you to set your torso at an incline. If you don't have access to an incline weight bench, a stability ball is a portable, inexpensive option. 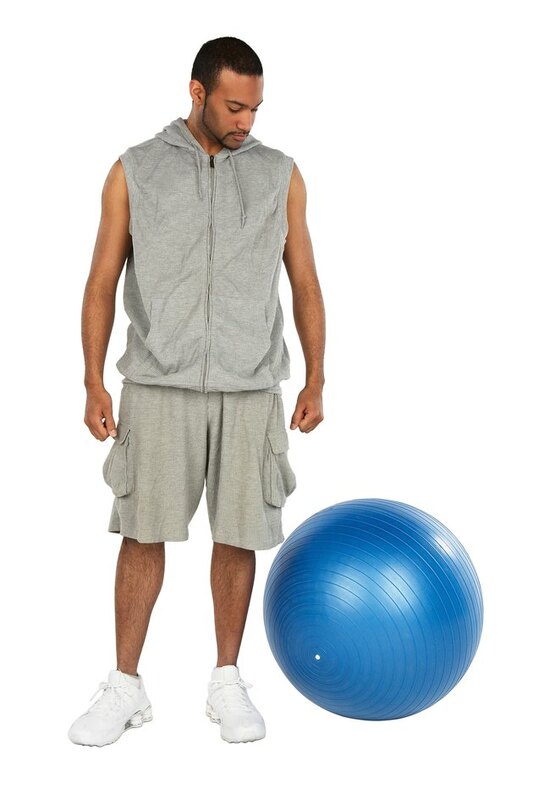 Select a burst-resistant ball for this exercise; if the ball is punctured, it will deflate slowly rather than exploding. Sit on the ball with a dumbbell in each hand and your feet flat on the floor. Walk forward, lowering your hips toward the floor. Keep your back straight. Stop when your hips are just off the ball and your lower back is pressed into the ball. Your torso should be at a 30- to 45-degree angle with the floor. Your shoulders and head should not touch the ball. Lift the dumbbells so they are in line with your upper chest. Your palms should face forward and your elbows should be at a 90-degree angle. Exhale and press the weights up and together. They should move in a path over your upper chest. The dumbbells should almost touch at the top of the movement. Pause for a count and then slowly lower the dumbbells back to the starting position. Do not angle your torso higher than 45 degrees, as this transfers the emphasis to the shoulders and away from your chest. Choose an appropriately sized stability ball. When you sit on the ball, your knees should be at the same height as your hips. If your knees are significantly higher than your hips, the ball is too small; if your knees are significantly lower than your hips, the ball is too large. If you've never used a stability ball, sit on the ball and practice rolling yourself out to a horizontal position. Get accustomed to how the ball feels and moves before you use weights on it. Stability balls have varying load capacities. Make sure the ball you use can handle your weight plus the weight of the dumbbells. What Percentage of My Weight Should I Bench Press?